Our most recent post included a checklist for knowing your customer. Knowing the answers to the questions on that checklist is a prerequisite for answering a critical strategic question, “What difference do you make in the lives/businesses of your customers?”. Some people call this a mission; others call it their purpose. It doesn’t matter what you call it. What matters is that you can define it and align your culture, strengths, and resources to it. It’s especially critical for your team to be aligned on the difference you make for your customers as you enter your strategic planning cycle. Download 7 questions you can use to spark a discussion that leads to better alignment of your team to your mission. 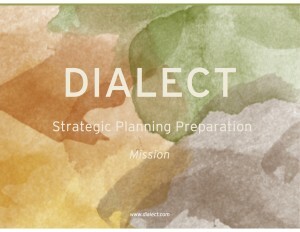 If you’re interested in how Dialect can help you prepare better for this year’s strategic planning, click here for a description of our workshop, Are You Ready? Getting Aligned Before Your Strategic Planning. If you’re not sure whether or not you know your customers well enough to know what problem you are solving for them, download our Know Your Customer checklist as a starting point.